Combine fantastic great day hikes around the Fitz Roy massif with the famous W trek further south. All travel, border crossings and accommodation are included and arranged for you by our trusted local operators, but hiking alone and unguided keeps costs down and gives you more control of your pace and schedule. You will board a bus in the Punta Arenas airport (PUQ) and be taken directly to Puerto Natales. The drive is approximately 3 hours, along the way you will be able to catch your first glimpses of guanacos and nandus. When you arrive in Puerto Natales a member from our staff will meet with you and take you to your accommodation and give you a briefing explaining the next few days and helping you with any last minute questions. After an early breakfast, you will leave Puerto Natales heading towards Torres del Paine National Park. At the entrance of the Park you will take a transfer to Refugio Las Torres, once there, you begin a gentle walk up Almirante Nieto, a mountain that takes you to an incredible view of Lake Nordenskjold and the Asencio Valley. You arrive at Camp Chileno a few hours after lunch. This is where you spend the night, so you can check into the refugio and leave your stuff in there, before continuing on the hike. After a short rest, you hike for one hour through a dense lenga forest. After leaving the forest, you approach a moraine and climb to see the amazing granite peaks known as the Torres. After admiring the view you return back to Chileno to have dinner and to sleep. You will hike a total of 13 km. This route involves climbing 761 m up to the base of the Torres, but also descending approx. 300 m when returning. There is one steepish section here where you will climb 200 m and then descend 200 m.
In the morning you will have breakfast and then prepare to hike again. You will leave Refugio Chileno and walk for four hours towards Refugio Cuernos, which is located on the coast of Lake Nordenskjold and the foot of the impressive Cuernos of Paine. Along the way you will border Almirante Nieto and pass by Lake Nordenskjold. You will have a few rivers to cross by hopping across rocks and also catch views of glaciers upon the mountain tops that are hovering over you. Finally you see the Cuernos! They are monstrous peaks, you will spend the night at the foot of them after a breathtaking journey. You will hike for 14.5 km. Aside from a descent of approx. 550 m at the start in order to get to lake-level, the hike will not climb or descend much more than 100 m. This is predominantly a gentle but undulating route. Shortly after breakfast you will begin hiking towards Camp Italiano. This camp is just two easy hours away. You will trek across a windy beach and finally escape into the valley and find that the wind is a little calmer. You can leave your backpack at Camp Italiano and continue into the French Valley with just a small day-pack. You will hike across a moraine and through a forest until you finally come to a clearing. Here you will be blown away both by the wind and by the spectacular views of Lake Nordenskjold, Skottberg and Pehoe behind you; the stunning hanging glacier called the French Glacier just ahead of you and by many of the peaks that are the reason why this park has become famous. After leaving the lookout you will return to gather your backpacks and continue to Refugio Paine Grande where you will spend the night. The distance covered here is 21.7 km. The journey into the Valley will climb about 643 m, but you will follow the same route back and descend approx 649 m. However, much of the ascent / descent is done over about 6.5 km, so whilst a sizeable change in elevation, it isn't too strenuous. After a restful nights sleep and an energizing breakfast you will be ready to hike again. Today you will have a short two hours up to the first look out of Grey Glacier. You will be able to experience the wind coming off the Southern Ice Field and see both the ice field and Glacier Grey! You will continue walking for 2 more hours until finally reaching Refugio Grey. At 1 PM you will take a boat to navigate for a while in front of the glacier in the hope of seeing icebergs calve. The return journey offers views of Paine Grande with its impressive ice mushrooms and we sail through icebergs of different tones of blue. A transfer will be waiting for you to drive you back to Puerto Natales on a different road with great views of the Paine Mountain. You will hike for about 4 hours at lake-level, the undulations on the route are only gentle, and you will not climb or descend much more than about 250 m in total. And you will spend two hours sailing, and the journey back to Puerto Natales will take another two hours approximately. Today you will take a morning bus to El Calafate, Argentina. You will arrive in El Calafate at approximately 14.00 hrs, and can leave your bags securely at the bus station while you explore town. Your bus to El Chalten will leave at 18.30 hrs so you may want to have an early dinner in Calafate. When you arrive into Chalten you will be met at the bus station up and transferred to your hotel. This trek affords great aerial views of the park. The trek is uphill all the way there and downhill all the way back! This walk is located a bit closer to the steppe than the others, so it has a bit more of a wild feeling. You are also able to get great views of Viedma Lake the largest lake of Argentina. This are used to be the sea bed and it's therefore possible to find ammonites and other fossils. If the wind is not too strong you can sit and have lunch with a view of Fitz Roy and Torre and the whole park below you! Return along the same path. Trek 6/7 hours. Distance: 18km. This trek is one of the highlights in the area and starts from El Pilar. You will leave El Chalten in a transfer to the trailhead, half an hour away. You then start this lovely walk in a forest on a path that ascends gently. The challenging section is one hour of steep uphill to get to Laguna de los Tres, later on in the day. The effort is all made worth it by the breathtaking views you get at the top, of Mt Fitz Roy and its satellite mountains. Weather permitting; you will have lunch at the lagoon. You will then start the descent towards El Chalten via Laguna Capri, another very photographic spot in the national park! When you arrive into El Chalten, you will walk another 10 minutes to your hotel. You can depart from the hotel by foot. The trek is a bit gentler than the Laguna de los Tres one - not so much climbing! The glacial valley is loved by geologists and photographers for its perfect shape. At the end of the valley you will find the Laguna Torre, its glacier and the famous Mt Torre - one of the most difficult mountains in the world to climb. You return along the same path that you came on. You will catch the 18.30 bus back to Calafate and taxi (pick up at bus terminal) to hotel. 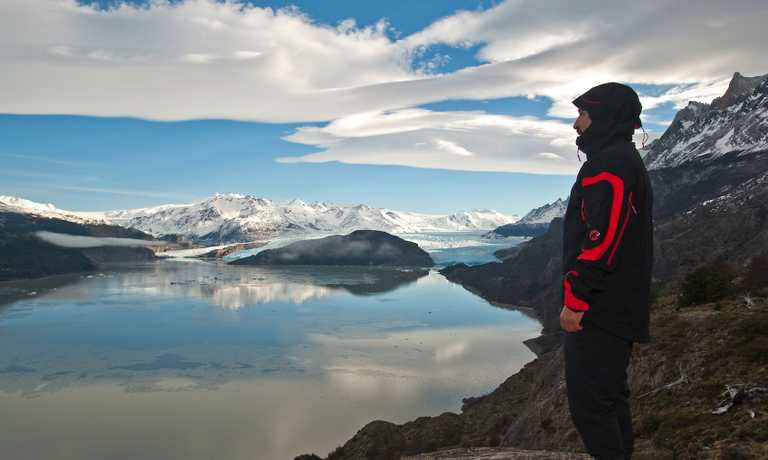 Today you will be picked up from your hotel and driven the 90km to the Perito Moreno glacier. On the journey there you will have a few photo stops; the views of Lake Argentino and the steppe are fantastic. On the peninsula in front of the glacier are the walkways which afford great views of the glacier face and its calving and a view along the top of the glacier towards its source. You will have time for wandering around and enjoying the views. There is a cafeteria at the glacier for snacks and hot drinks. Return to El Calafate for a final celebratory dinner. Depending on what time you your flight is you might have time for visiting the centre, bird watching at Laguna Nimes or visiting Glaciarium - the ice museum - a really interesting insight to the glaciers of Patagonia! (And maybe a drink in the ice bar?!) Order a taxi/regular bus service through the hotel to get to the airport for your flight. It was excellent to have all the accommodation and transport organised - particularly the multiple bus and shuttle trips and transfers - but then to be able to walk independently. Our hike was both fantastic and challenging; undoubtedly the best part of our trip - so remote and beautiful. Price is based on two people. Please note if you are a solo traveller the price will be higher.